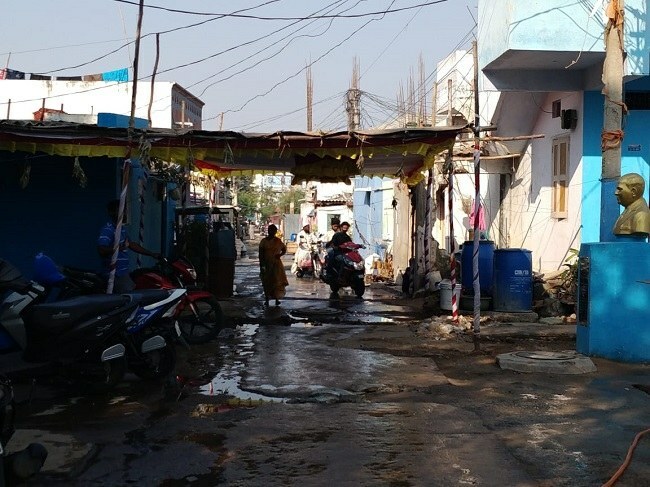 TNM travelled to three slums in Secunderabad Cantonment constituency and spoke to residents about the issues plaguing them ahead of the Telangana Assembly Elections. 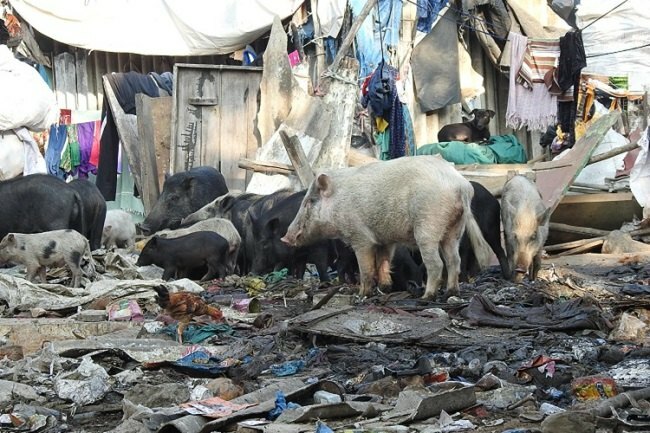 A broken pipeline, a stream of faecal matter, a large amount of garbage strewn around, many pigs feasting on the garbage and a nauseating stench greet one at the lone toilet for the Uttaraiah basti (slum), located in Secunderabad Cantonment Board’s (SCB) Ward No 3, adjoining Sikh Road. But the sprawling basti’s problems only begin here. The toilet, located at the basti's entrance, makes the area almost inaccessible. What’s more, a large number of huts have come up around the toilet. At Uttaraiah basti, however, this is only the beginning of their troubles – there are no street lights, no authorised electricity, one connection for drinking water for the entire basti with no guarantee on when there will be supply. "I don't even know how people are able to eat with this nauseating smell. At night, we just shut our doors tight and hope that mosquitoes don't enter. Fevers and skin allergies are prevalent in the area. 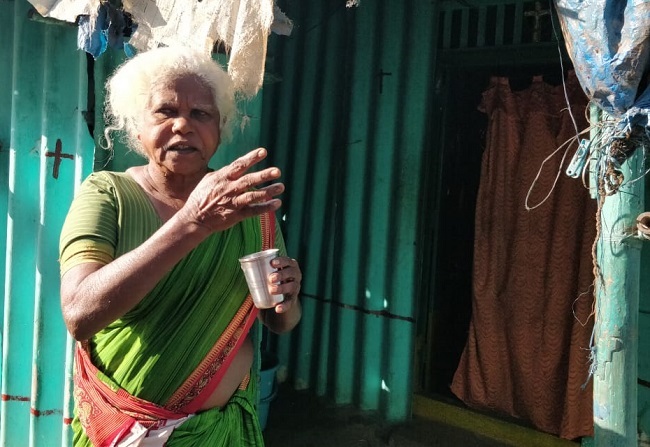 We asked authorities many times to at least get the bathroom cleaned so we can use it but we finally pooled money and did it ourselves," says Lakshmiamma, a woman in her late sixties, her voice quivering with anger. 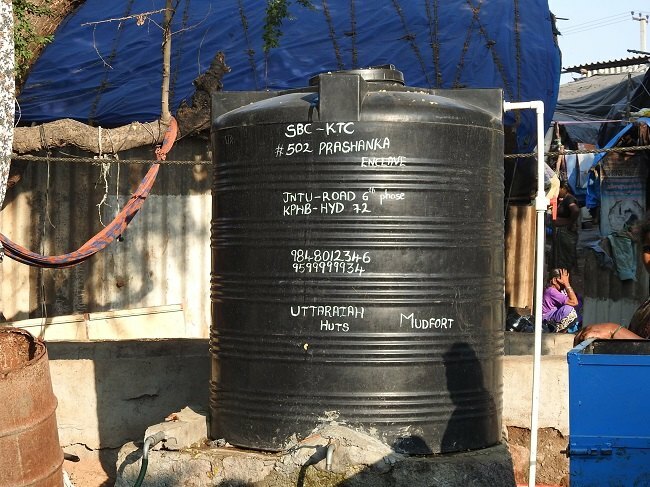 Even though the SCB has constructed a bio-toilet nearby, slum-dwellers say that it opens late in the morning, and the waste flows back into the drain and through the area, defeating its purpose. "One bathroom is closed in the night and the other stinks. Where do we women go? 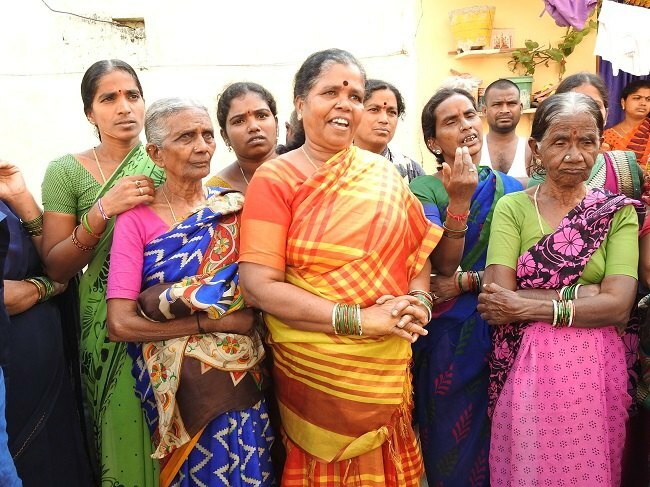 We only get an arrogant response when we ask our local SCB ward member," Lakshmiamma says. 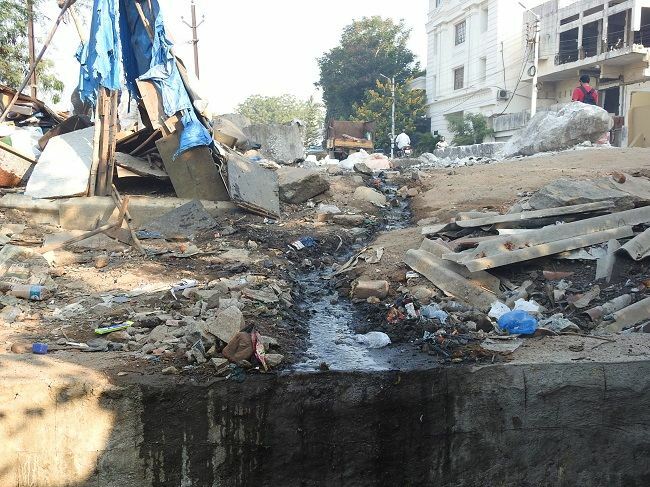 The open drain that gives the residents of Uttaraiah basti many sleepless nights carries waste from the nearby affluent Gunrock Enclave. 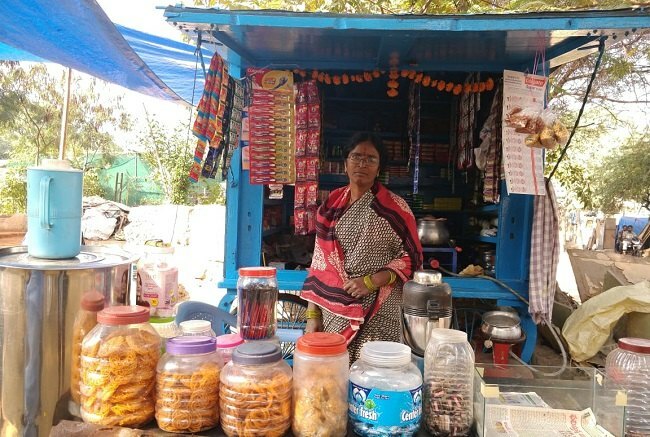 Sivamma, who has lived in the area her entire life and runs a tea stall nearby, says that the toilets are of utmost concern, which is forcing people to defecate in the open as they are often left without a choice. "The existing toilet is filthy and almost unusable and the bio-toilets are locked. When we are sick and we have no choice to move, we build a small structure with bricks and use a pit latrine," she adds. For water, the basti has been provided with borewells at a few points, but there is no power meter attached to it. Residents of the basti, mostly daily-wagers, don't have any control over when they get the water. "If the authorities give us a meter, they insist on keeping the key to the switch and they will come only by 11 am. Many of us are daily wage labourers and maids and auto drivers. We need to leave early in the morning and we can't afford to wait for them. That's why we're using our own lock now," says 22-year-old Venkat, a resident. Residents also say that they are willing to pay for water meter charges, in order to have control over the water and its timings. But then, the electrical connection in the area is embroiled in politics of its own. Slum dwellers have been protesting for 25 years to receive power connections, which is inextricably linked to a land ownership battle. The Secunderabad Cantonment Board (SCB), a local municipal authority under the Ministry of Defence, functions as a local self-government as per the Cantonments Act of 2006. Elections to the different 'wards' of SCB are held every 5 years. The SCB has repeatedly insisted that locals in Uttaraiah basti are encroachers of defence land and if they manage to get an electricity connection, the board's argument may not hold in court. "The Electricity Department refuses to give us a power connection because that would mean that the SCB can't treat us as encroachers anymore. Despite making a promise that we would all get power meters under the Centre's Saubhagya scheme, the local MLA has not done anything. 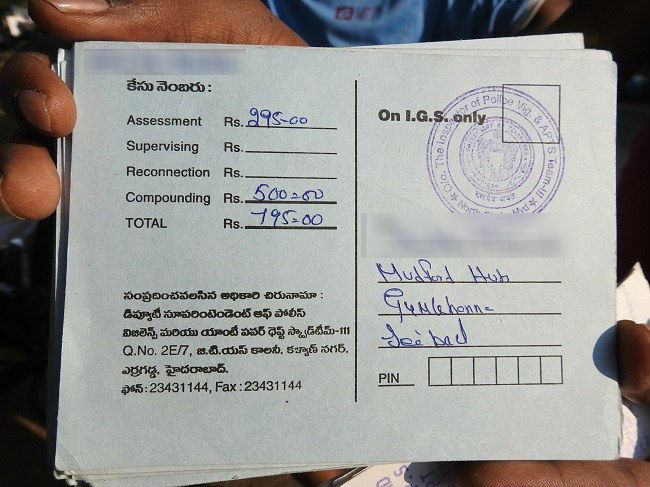 Instead, we just 'steal' power and pay a fine every month to compensate for it," says 22-year-old Venkat Ramulu. G Sayanna, the Secunderabad (Cantonment) MLA was elected on a TDP ticket but jumped to TRS in 2015. "Sayanna made all these promises, but he doesn't even address our concerns when we went and protested outside his house or at the cantonment office," says 25-year-old Lingaiah. Just behind Uttaraiah’s huts, down a winding road, lies Ambedkar Nagar. At first sight, it is evident that the residents here don’t have the tag of an ‘encroacher’ -- each house has a blue SCB plate with a house number. Gunrock Enclave, however, continues to give these residents sleepless nights too. 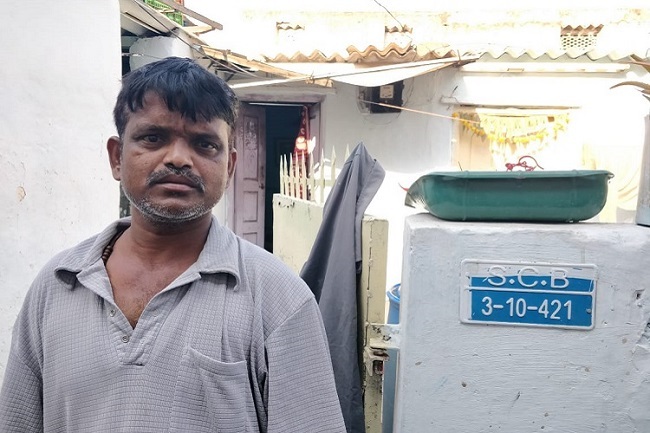 Despite the drain being closed in Ambedkar Nagar, it overflows right in front of their homes, and as soon as the monsoon arrives, sewage enters their homes. And while all houses have a half-foot tall raised cement structure at the front of each door to obstruct sewage entering the homes, residents say this isn’t enough. "It has been this way for a decade. Every politician who was elected from here has seen this and has done nothing about it. All our belongings get soiled as sewage that enters our homes, and our homes are flooded up to thigh-level. I lost all my appliances last time," says Dubba Srinivas. Srinivas, a plumber, adds, "We are helpless. Every time water flows in, we just have to wait for it to recede." The drain, which carries the waste, often carries silt which is never cleaned. It's dangerously close to the surface during the non-rainy season, but when the monsoon arrives, it strikes fear in the hearts of the residents. "The municipal workers only clean the drain when it rains and that also only on the surface. Proper desilting is not done, which leads to the entire colony getting flooded. All the garbage that people casually throw into the drain also ends up here," another resident adds. The bylanes of Ambedkar Nagar are an obstacle course with no proper roads, and a massive manhole every few feet making minor accidents commonplace. Traces of what was once a cement road can be seen jutting out, but even a two-wheeler has trouble navigating the narrow route. "They laid a new road a few years ago but they always end up digging and cutting it immediately for fixing the drainage problem,” Bhaskar, a local Congress leader alleges. 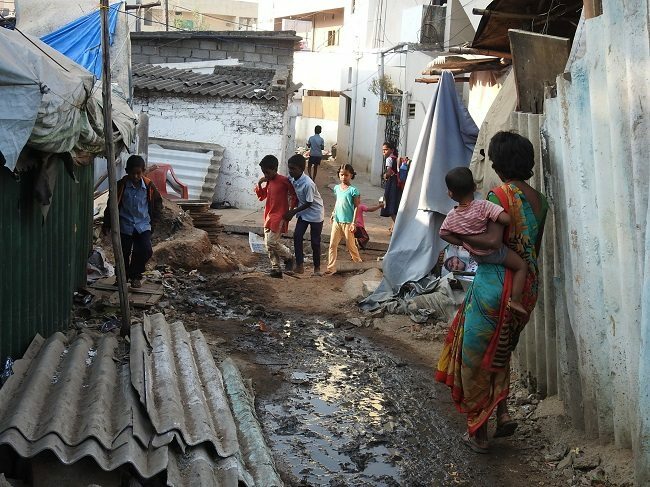 The slum also has only one bore that provides clean water to more than 400 houses in the area. Even then, locals allege that the sewage and potable water pipelines sometimes mix, and they end up getting black and murky water. A few kilometres from the Uttaraiah basti and Ambedkar Nagar is Anna Nagar, situated in Rasoolpura, abutting the runway of the Hyderabad’s old airport at Begumpet. While there are more concrete structures in Anna Nagar, residents are caught between the SCB, the central government and the state government. Because of this, people who have been staying in the area for decades have no land 'pattas' (ownership deeds). Even locally, residents say that they are stuck in a local battle with half the area falling under Ward 3 of the SCB and another half under Ward 2, making them run from pillar to post. "We have been staying here for close to 40 to 50 years. We grew up here and our children have also grown up now. We have been asking the same of successive governments but to no avail. All politicians promise that they will get us pattas but forget us after we vote for them," says Lakshmi, a housewife. While irregular water comes once in five to six days and bad roads are also a problem here, residents say that all that can take a backseat. "We have our electricity bill, Aadhaar card and voter ID cards but nothing gives us the proof of residence like a patta. Even now, they can evict us tomorrow without a moment's notice," she adds. "While the SCB has given each of us a door number, it is only for their reference. Even for a loan, they ask for patta," says Rangamma, another resident. The residents of Anna Nagar say that ahead of the 2014 elections, Chief Minister K Chandrasekhar Rao had visited the area and promised to adopt it. "However, no such thing has happened. Instead, we live in fear and we don't know what will happen. All of us leave in the morning to work every day and we are afraid about what might happen by the time we return," says Mahadevi, a housemaid. Anna Nagar’s problems are exacerbated by the fact that the TRS government wants to construct a new Secretariat at the Bison Polo Grounds nearby. "We voted with belief and ensured that KCR was brought into power. If the Secretariat comes so close to us, what is the guarantee that they won’t take our land next? "Anitha asks. As problems pile up in the area and residents continue to be at loggerheads with the establishment, there are different political factions in Uttaraiah basti, Ambedkar Nagar and Anna Nagar. At Uttaraiah Nagar, Bhaskar says, "This area has always traditionally voted for TDP. In fact, our local MLA and MP were TDP leaders who were elected but later defected to the TRS. This time, many in the basti will vote for the Mahakutami only as Sayyana has failed to listen to our grievances even though we were the ones who made him win." "Instead, he's worked hard and split the basti into two factions; one that favours the TRS and one that favours the kutami," he adds. Even those in the area who plan to vote for Sayanna, the TRS candidate say that they are only doing so out of fear. Locals in this area gave up their homes for the TRS government’s two-bedroom housing scheme, and are worried that they won’t have a house if the TRS government is ousted, and someone else comes to power. “The area has its drainage problems, we will still vote for Sayanna. Our houses under the 2BHK housing scheme of the Telangana government are under construction, and we are hoping that we get possession of our house. My house hasn’t been razed yet, and I don’t know when I will get my house. If the Congress candidate comes to power, we are afraid that it will get stuck, and we won’t get homes,” says Aparna*, a housemaid from Sriram Nagar, neighbouring Ambedkar Nagar. Parvathi a mother of two girls getting her younger daughter ready for school at Uttaraiah basti, says, "Our children are not able to study. There is not even a streetlight for them to study under. We have settled here and worked hard to ensure that our next generation gets a better life, but it is difficult." While Parvathi hopes for a better future for her two girls, she's livid with the MLA. "How can we support them? Our votes seem to have gone with the wind," she says. All images by Haripriya Suresh.